Hammering Man is on the job 364 days per year. As I made my way downtown from my hotel, the outstanding Sorrento Hotel, I kept my eyes peeled for anything that would pluck me out of the rain on yet another soggy Seattle day. 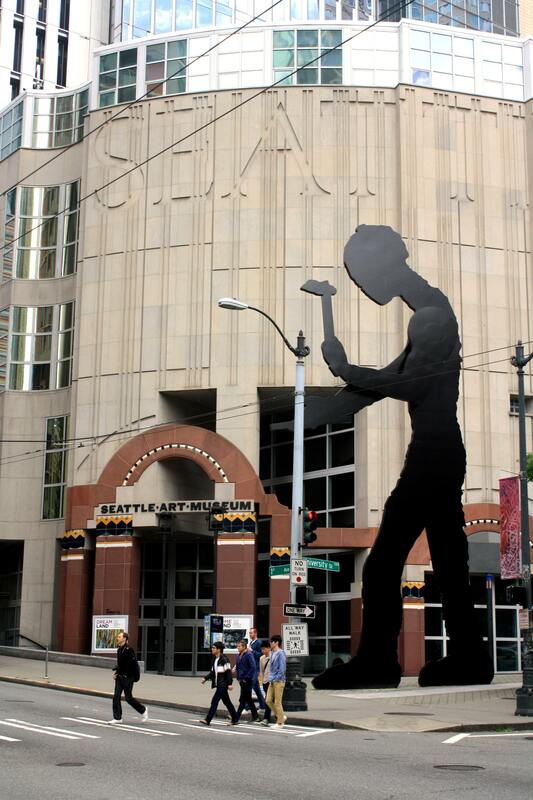 It didn’t take me very long to notice the 48-foot-tall moving sculpture in front of the entrance to the Seattle Art Museum. Hammering Man, artist Johnathan Borofsky’s three-story hollow-fabricated steel sculpture, has been silently plugging away since 1991. Weighing about 22,000 pounds, the man holds a hammer at the end of his aluminum mechanized arm, raising and lowering it two and a half times every 60 seconds in endless exertion, 364 days a year. He takes only one day off per year — and it’s not the one you’re probably thinking of. This piece of living art presents a fine introduction to the Seattle Art Museum. Since it was founded in 1933, the museum has been educating and entertaining its patrons through both its short-term special exhibits, which have ranged from Paul Gauguin in Polynesia to ceramics, from Buddhist art of the Silk Road to the fashions of Yves Saint Laurent, and its permanent collection. The collection, which has expanded from 1,926 pieces in 1933 to more than 25,000 today, spans the globe in an eclectic mix of memorable art that includes, among other items, Liberian and Gabonese masks; ornate clocks; Oceanic, Asian, and European paintings and statues; and vases, tapestries, and armchairs. The works can inspire, move, or provoke you; at best, they do all three. 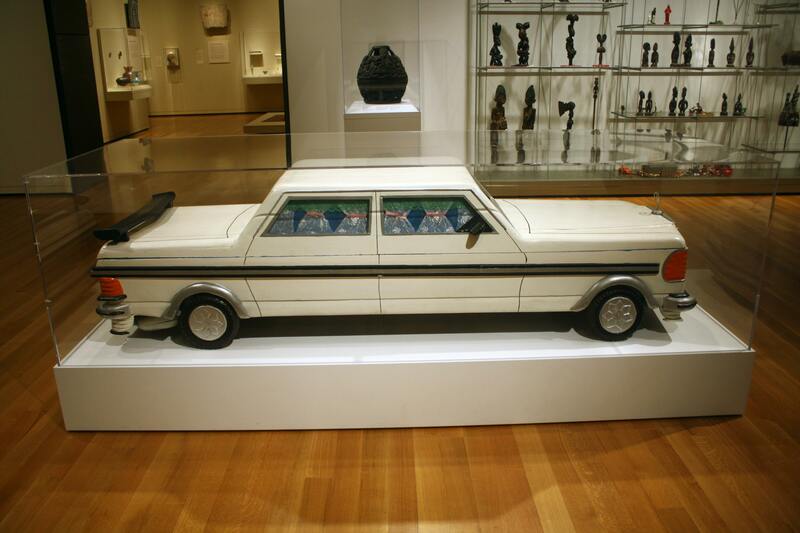 Right off the bat is Kane Quaye’s Mercedes Benz Coffin, a nine-foot-long boxy replica of a Mercedes Benz that, should you slide the top off, conceals an upholstered interior with a pillow. At first, I pondered exactly why this odd creation was here, seemingly out of place in the midst of African sculptures in glass showcases. But things became clearer, and thought-provoking, upon further investigation of the piece that evokes the Ghanian culture of the artist. When someone dies in Ghana, his or her survivors turn mourning into a celebration by (if they can afford it) arranging feasts, hiring orchestras, and striking up a parade that takes the decedent, in a coffin, around town to the places that held special meaning for their loved one for a final goodbye. “All a dead person owns in his coffin,” Quaye has said, so why not go out in style — and a unique style at that. Coffins shaped like snakes, airplanes, roosters, and Coke bottles have weaved through village streets in Ghana. This piece forces you to consider exactly how you would like to make your final exit: Pine box? Two-hundred-pound steel casket with ornate hardware and plush cushioning? Or a luxury car? Saint Sebastian is all about light and dark. More traditional art can be found in three of my favorite paintings here, all from different centuries. The oldest dates from about 1638. Saint Sebastian Tended by Saint Irene, by the French Baroque painter Georges de La Tour, is one of his signature religious pieces that employ the technique of chiaroscuro — the use of pronounced contrasts between dark and light (in de La Tour’s case, usually candlelight) to heighten the drama and emotion of the subjects. 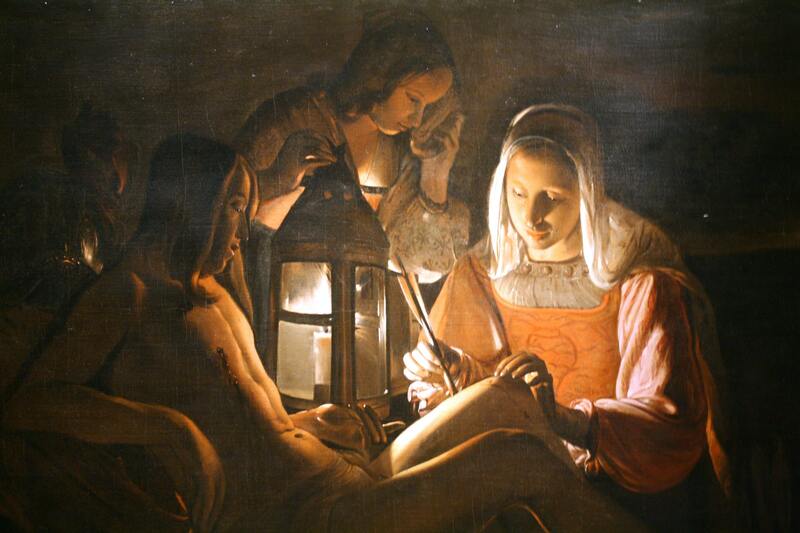 Here, a secondary figure holds the light source, a single candle in a large lantern, in the center of the painting, partially illuminating the wounded St. Sebastian but really highlighting the tender hands of St. Irene as she gently removes an arrow from his thigh. Venice looks the same today as it did in 1710, except for the people. 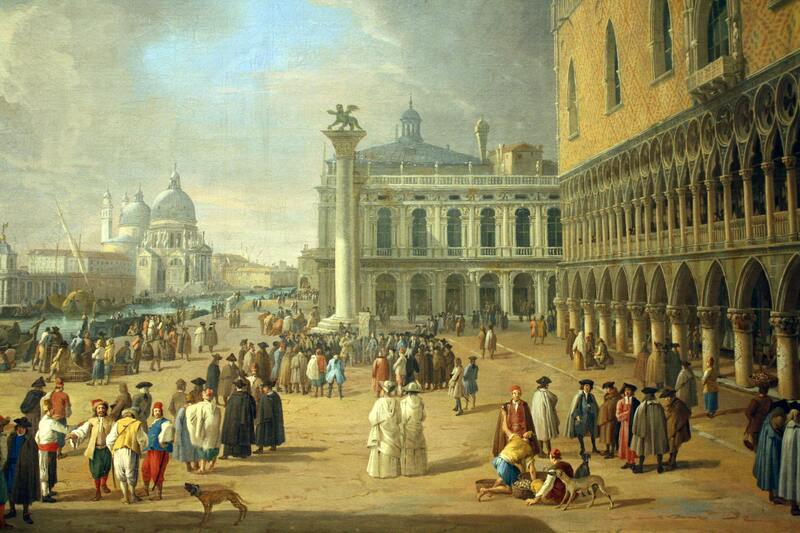 Nearly a century later, in about 1710, Luca Carlevariis painted The Doge’s Palace and the Grand Canal, Venice. Any visitor to that famed Italian city today, 307 years later, would recognize the same architecture depicted here: the Doge’s Palace, the column topped by the winged St. Mark, and the Basilica di Santa Maria della Salute, with the blue ribbon of the Grand Canal, plied by just as many vessels as today, leading your eye deeper into the painting. What’s changed, however, are the types of people populating the scene. Now, this particular section of Venice is almost always jam-packed with tourists from around the world, toting maps of the city and buying souvenirs, following an umbrella-wielding cicerone. In this painting, the area is packed with traders from around the world, engaging in the exchange of goods. Just a quick look at the different types of hats worn by the figures signifies that Venice was a major center for global trade. Men haul off wooden cages, maybe holding exotic birds for some voluptuary in his palazzo. A vendor offers perhaps a head of garlic from his wicker basket to a customer, while another vendor carries similar products in a basket atop his head. A gentleman with a wooden leg reads to a circle of a few dozen listeners, possibly announcing an excursion to a foreign land and looking for backers. In the midst of all the entrepreneurial bustle of a city built on mercantilism, two women dressed entirely in white in the lower center anchor the scene with a sense of calm, hinting, perhaps, at the existence of something purer. 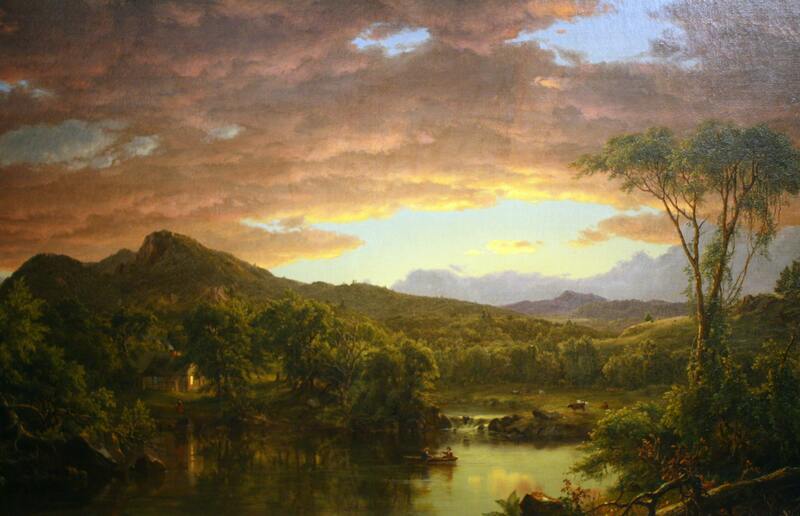 Finally, from 1884, Frederic Edwin Church’s A Country Home provides a respite from the above frenzy in a serene pastoral scene. Salmon-colored clouds tinged with yellow hover over the hilly landscape. Two figures in a rowboat emerge from the shadows into the illuminated part of the pond before a small waterfall, where animals graze at the water’s edge. At first, I completely missed the country home in question, as the sky is the real eye-catcher. But then I noticed the modest home, with one illuminated window that’s reflected in the water, set deep in the trees and approached by a woman in a red skirt. I could almost feel my eyes grow heavy with welcome relaxation just by gazing at this work. Given Seattle’s location, it’s no surprise that the museum owns a strong collection of Native American art. Among my favorites are The First People, by the Musqueam artist Susan Point. At first, the faces representing First Nations communities carved in red cedar seemed identical. A closer look, however, revealed subtle differences in their brows, for instance, or the lines around their mouths. In Song for the Moon, by Puyallup tribe member Shaun Peterson, a dour full moon lours at you from above a snow-covered mountain and black pine trees against a brilliant blue sky while a wolf beats a drum in the foreground. Rockwell’s hazy sunrise over Astoria, Oregon. Pacific Northwest art is well represented, too. 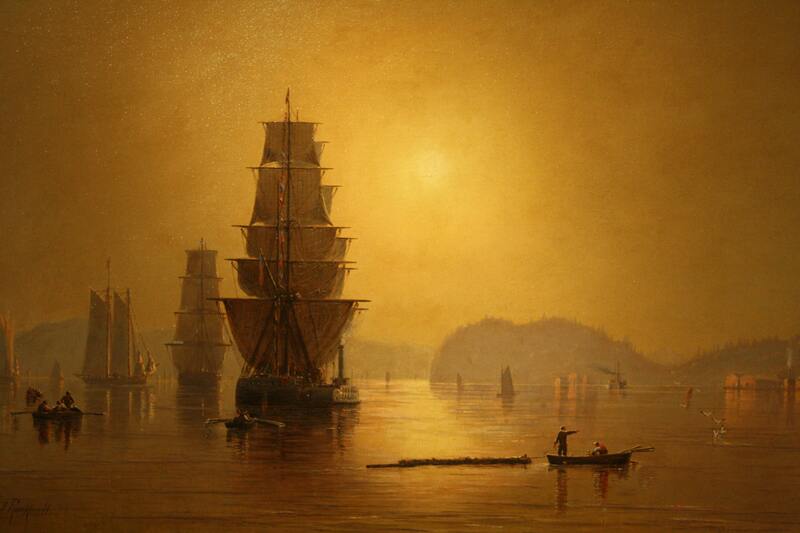 Cleveland Rockwell expertly captures the haze of early morning in Smoky Sunrise, Astoria Harbor, a moody piece that reveals the day’s rise to action in the harbor near the end of the Columbia River along the Oregon-Washington border. Ocean clippers, rafts, dinghies carrying loggers and salmon fishers, and a steamboat crowd the water. Humans are not the only ones astir: Half a dozen white birds with black-tipped wings dive into the water, having spotted their latest meal. Closer to Seattle’s home, Puget Sound on the Pacific Coast, an oil painting by the magnificent Albert Bierstadt, stretches more than four feet high and nearly seven feet wide. Created in 1870 before he had even visited the area, this tempestuous piece depicts one heck of a storm on the Washington coast. White rays of light slant diagonally from an increasingly threatening sky, illuminating the figures below who are hurriedly pulling their small boats ashore, seeking shelter in a little cove from the ferocious waves of a green sea crashing upon the rocks, threatening to turn their vessels into matchsticks. Menacing and ever-darkening clouds dominate a good quarter of the painting, and trees clinging precariously to tall rocks tilt dangerously above the sailors, presenting a potential and rather unexpected hazard. When I exited the museum several hours later, Hammering Man was still working. Painted in flat black automotive paint and lacking any particular features, he makes it easy for everyone who looks at him, from nearly every socio-economic stratum, to identify with him, whether they’re at a desk in a shiny office tower 20 stories above ground or in a grimy mine 20 stories below. He would continue to toil nonstop until he rests for 24 hours on the first Monday of September — Labor Day.